© 2000 Edward J Law. registered by John Winter, John Parsons and Charles Hall. Winter, who had served his apprenticeship with Thomas Law, was a founding Guardian of the Standard of Wrought Plate, the body which administered the Sheffield Assay Office. He was the principal manufacturer in the candlestick trade, and whilst he was also a partner in the firms of Richard Morton & Co. and Samuel Roberts & Co. he safeguarded the candlestick trade, to which the firm of John Winter & Co. restricted itself, by imposing covenants that the other companies should not compete in that facet of the trade. Nothing further is known of the partners. in a quatrefoil on 24th September 1831, the first occasion on which a mark of that outline had been impressed. Henry Wilkinson who was born c.1787 was apprenticed with Messrs Settle, the firm which he eventually succeeded. The firm of Wilkinson & Co. were extensive manufacturers of silverware for the remainder of the nineteenth century, Henry Wilkinson was the first Mayor of Sheffield and died in 1873. The individuals involved, probably in both firms, were Matthew Fenton, one time apprentice of Thomas Law and one of the founding Guardians, Richard Creswick and William Watson. Creswick left sometime after 1778, in which year their utensils and stock were insured for £2,000. When Fenton left the firm of Fenton, Creswick & Co. he was replaced by Edward Oakes and the style was changed to Fenton, Creswick, Oakes & Co. Oakes was probably the firm's traveller; he is noted in the above day-book making 'the North Journey' and travelling to Dublin. He left in 1789 the firm continuing in the style of Fenton & Co. When the partnership was dissolved in 1795 both the principals were dead, Matthew Fenton being represented by his widow, Mary Fenton, and William Watson by Thomas Watson. No output has been noted for Watson & Co. It has been said that William found trade uncongenial. In due course he became, as had his uncle before him, a director of the Sheffield Banking Co.
Thomas Bradbury & Son went on to become one of the leading firms of Sheffield silversmiths in the nineteenth and twentieth centuries until taken over by Messrs Atkin Bros in 1947.
entered by John Hoyland, one of the first Guardians, John Trevers Younge, Thomas Smith and Elizabeth Middleton. The latter no doubt having taken the share of her late husband, William Middleton, toyman, who died in 1768. John Hoyland was a party to the executrix's bond relating to his estate and was described then as a button maker. Hirst tells us that Hoyland learnt the trade whilst employed as traveller to Thomas Boulsover, the inventor of the Sheffield Plating process in 1742. With that experience Hoyland went into business on his own account, later taking John Trevers Younge, Edmund Greaves and William Middleton into partnership. being entered on 1st August 1788. All the partnerships to that time had produced a full range of silver wares from tea tongs to candlesticks. By 1802 Younge's two sons, Samuel and Charles, had joined the partnership and in that year William Crowder withdrew. James Gregory is noted as a partner at the time of the partnership dissolution in 1810. No new marks are noted in this period. It is possible that Gregory had previously been in partnership with John Staniforth as James Gregory & Co.; if so it may be that he joined J T Younge & Co. in 1804, the same year in which John Staniforth registered a mark on his own account. on July 1811. Nothing further is known of the partnership but the mark continued in use down to 1828.
were entered by Richard Morton, Thomas Warris, John Winter, Samuel Roberts, John Elam, Thomas Settle, John Eyre and Nathaniel Smith. It is on record that this firm was not to produce silver candlesticks, that branch of the trade being reserved to John Winter. There may well have been covenants as to non-production of certain other items as all of the partners except Morton and Warris also comprised the partnership of Samuel Roberts & Co. who registered their mark on the same day. The Assay Office day-books show that John Winter & Co. produced buckles as well as their main product of candlesticks, the latter being the sole output of their successors John Parsons & Co. Samuel Roberts & Co's main output was silver handles, but they too produced candlesticks. Richard Morton & Co. manufactured a wide range of products, but noticeably not candlesticks, buckles or silver handles. on his own account; Warris and Settle went into partnership together; Roberts and Eyre did the same and Smith commenced the firm of Nathaniel Smith & Co. The names of the other partners and the duration of the partnership are not known. However, it seems likely that the partners were in fact Thomas Warris and Thomas Settle for an insurance policy was taken out in all three names, as silversmiths and plated manufacturers, in September 1780. We know that Morton was in partnership from 1798 with John Morton, Anthony Handley, Thomas Sykes and Thomas Settle, and that partnership continued after the retirement of Sykes in 1805. In February 1806 Handley withdrew, assigning his interest to Richard Morton who continued the firm with Job Morton and Thomas Settle. That partnership probably continued down to the death of Richard Morton in 1812, in which year Thomas Settle joined the partnership of Settle, Mosley & Settle. The fact that there was no mark registered after 1781 would suggest that the firm had a continuous existence. No silver output has been noted after 1802 and it may be that there was a change of emphasis in the partnership at about that time. in September 1793. The firm were instrument makers operating from Morton's premises in Fargate, and the partners, who included Thomas Holy, William Newbould and Joseph Wilson, had succeeded to the business of the latter in 1778. The origins of the important firm of Tudox & Leader are first noted in 1763 when John Sherburn, Henry Tudor and Thomas Leader entered into an equal partnership with a capital of £3,000 for a period of forty-two years. It is conjectured that the unusual length of the proposed (and subsequent) partnership may have related to the unexpired term of a property lease. The statement that Tudor and Leader were in partnership by 1760 cannot be confirmed but a clause in the agreement of 1763 that the trade was to be carried on in the workshops of all three partners is perhaps an indication that it was a renewal of an earlier partnership. Henry Tudor was one of the seven Sheffield silversmiths who registered a silver mark with the Goldsmith's Company in London prior to 1773. The mark registered is not known; it was almost certainly in the missing Largeworker's Register of 1759-1773. In a recital of the partnership indenture of 1763 Sherburn is described as a silversmith. If that is correct then it is perhaps the earliest notice of a Sheffield silversmith as opposed to silver platers. Sherburn died in 1772 leaving his partners extensive legacies, including his interest in the business premises and the dies, only on condition that they each purchased a ring to the value of £10 or more with the motto "J Sherburn is gone before me". In 1778 they entered into a contract of employment with Samuel Nicholson, rider (traveller) and bookkeeper, by which he agreed to serve them for five years at a salary of £84 pa. They further agreed that he would thereafter be taken into a sixteen year partnership, and that the "Firm of the house" would then be Tudor, Leader & Nicholson. All the parties fulfilled their commitments and as reward for his good service Nicholson was allowed to take a one ninth share rather than the promised tenth. At the end of June 1785 Daniel Leader, Thomas's brother, came into the business as a junior partner and the name of the firm was changed to Tudor, Leaders and Nicholson. At that time the capital of the concern had been increased to £18,000. It is said that Daniel Leader had been apprenticed to the firm in 1762 as a box maker. His work-book survives for the period 25th February 1775 to 18th March 1785. Like other skilled workers in the trade he was remunerated on a piece work basis and had his own assistant, possibly an apprentice, for whose pay he was responsible. By January 1793 Thomas Leader had retired to his native Essex and had made a private assignment of part of his share of the profits of the concern to Thomas Leader the younger. Because of differences which had arisen the partnership was dissolved from 1st August 1792 and reconstituted under the same name for a period of six years five months, the partners being Henry Tudor, Thomas Leader, Samuel Nicholson, Daniel Leader and Thomas Leader the younger. Having drawn up the accounts of the concern to 9th May 1795 the partners decided that it had not answered the ends which were intended (presumably it had either lost money or failed to return more than could be obtained by placing money at interest) and agreed to cease the business from 8th September 1796. As no further marks had been registered it seems that the original mark of 1773 had been continued through to 1796. On the dissolution the stock, materials and tools were divided into fifteen equal parcels and the partners drew lots for them according to the number of shares they had in the concern. It is clear from this division of goods that the partners intended to continue in the trade. being registered by the two of them in January 1797. ln March 1799, Samuel Nicholson having died, Tudor purchased his interest from his widow and immediately sold the whole of the partnership assets to the Sheffield banker John Shore, receiving £300 in respect of the goodwill of the trade. with John Shore in August 1799. Little output of the concern has been noted. The partnership had been dissolved by August 1804. The partnership ended in 1810. Bradbury states that the business continued until 1816, but the title page of an auction sale catalogue records a sale of silversmith's tools etc. on the premises of Thomas Leader Esq., in Sycamore Street, on the 30th May 1814 and the ten days following. This sounds to have been a huge sale and we must assume that for some reason Thomas Leader had kept on all the equipment, either lying idle or possibly sub-let to others. Daniel Leader died in 1817 aged 73.
on his own account on 3rd October 1776. The day-books of the Assay Office show that he was producing principally silver handles with occasional small wares such as whip caps and tea tongs. He died in 1781, being described in his will as a cutler. on his own account in 1793 may well have been his son. It is significant that in his will of 1779. Birks gave his occupation as cutler. He died in March 1783 when his stock in trade was left to his two sons, William and John. on 20th September 1773. Another of the founding Guardians he had been a leading manufacturer of silver plated cutlery handles and was Master Cutler in 1753. He was one of only two firms who combined the trades of cutlers and general silversmiths. The Assay Office day-books show that as well as the general silver wares of candlesticks, tankards and coffee pots he was a major producer of silver handles. Among those who served their apprenticeships with him were Matthew Fenton, Samuel Roberts (c1736-1799), John Elam and John Winter. He died intestate, prior to June 1775, and in the grants of Administration of his estate three of his sons, Thomas, William and John are noted as silversmiths. for a consignment of blades which he sent for assay that month. That seems to have been an isolated transaction and he is thought to have continued in partnership with William until 1813 when the latter withdrew, following which John appears to have forsaken his father's mark in favour of his own. 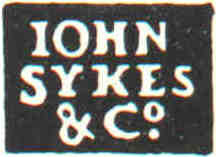 Atkin's mark was re-entered in 1853 under the style of Atkin Brothers. The firm survived into the twentieth century, taking over Thomas Bradbury & Sons in the 1940s and being acquired by C J Vander of London in 1958.
on 30th September 1773. The Assay Office day-books contain entries for both Samuel Roberts and Samuel Roberts & Co. and it seems they may have operated as distinct entities in the early days. The reason for this may lay in the fact that in 1773 candlesticks were entered under the name of Samuel Roberts whereas the output of the firm comprised only handles. The partnership ceased in 1780 when Thomas Settle went into partnership with Thomas Warris, and Nathaniel Smith went into partnership in a company of the same name. 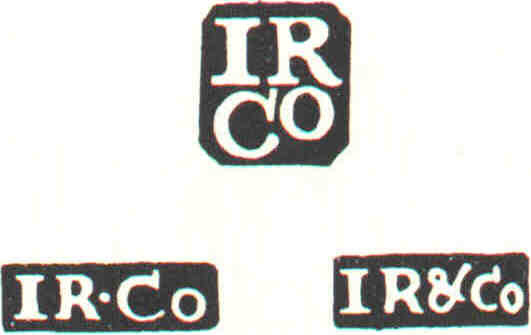 entered on the same day as the partnership mark was a matter of form and that although Jacob and Samuel Roberts had been in partnership together from 1777, as makers of table knives and forks, in an agreement which was not due to expire until 1791, they would not be permitted to produce silver so long as they remained partners in Roberts, Eyre, Beldon & Co.
entered by John Eyre & Co. in 1818, which may be a later generation. which he entered in April 1774. The day-book shows the partnership sending in candlesticks, and Marsden buckles. in March 1774. Neither of the concerns are noted in the day-books after 1774 in which year Greaves & Wilson submitted candlesticks and aperns (epergnes?). It is possible that Samuel Wilson was the same individual who was a partner in Ashforth, Ellis & Co. in the 1780s. in 1773 are said originally to have been makers of lancets and were subsequently of the firm of Proctors & Beilby, opticians. Judging from entries in the day-books, which include scales, weights, hunters' knives and forks, and medals, the firm avoided the mass production market. It is thought that silver production was very subsidiary to other business activities. It is not clear whether it was this Luke or his nephew, Charles's son, who was a partner in Thomas Pasmore & Co. and Luke Proctor & Co. from 1784 to 1795. It was probably the nephew for the uncle appears not to have prospered, unlike his brother who left some £10,000 on his death in 1808. His will included an annuity to his brother Luke with a request that his sons behave in a kind and affectionate manner to their uncle. entered in April 1795 by Charles Proctor & Thomas Beilby may have been a result of the departure of Luke Proctor from the firm. in March 1817 may have been Charles's son. Ashforth, Ellis, Wilson & Hawksley. Ashforth, Ellis, Wilson & Hawksleys. The partnership ended by 1812, Wyllie recording that they were bankrupt by 1811. They only registered the one silver mark and for the first twenty years appear to have had a steady trade, principally of candlesticks, but including salts, tea pots and coffee pots. George Ashforth died in 1817 at the age of 87. There were several John Roberts in the trade and it is not known whether he was in business before or after this partnership. 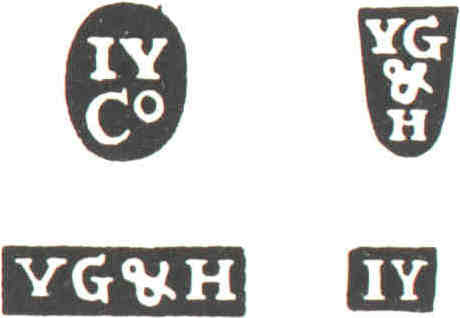 in November 1774 and are noted sending buttons for assay. It is clear that Holy was a very able business man, in addition to button making he was a merchant trading with America and was a partner in a firm of instrument makers. His involvement with the latter arose in 1778 through a debt owed to him by Joseph Wilson, an optical, mathematical and philosophical instrument maker. The other partners in Joseph Wilson & Co. were William Newbould, Richard Morton, Thomas Warris, Thomas Settle and Joseph Wilson and the business was carried on in Morton's workshops in Fargate. or go to Essay 1: THE ORIGINS OF THE SILVER TRADE IN SHEFFIELD. Edward Law, interests, bibliography, and the Victorian prize medals of Huddersfield College. Anastatic printing, some brief notes, relating to photograph and crest albums and Cowells of Ipswich. Crest Collecting, research findings, album publishers and scans of crests. The Sheffield Assay Office, where you will find details of their publications for sale.